Proper preparation and gear are essential to avoid winter camping problems. Let’s look at five winter camping challenges and how to avoid them. After a weekend of winter camping, the next step is to pull into the dump station to empty your tanks. You then pull the dump valve and nothing happens as the contents are frozen. Now, you will have to wait until they thaw before you can dump the waste. To avoid this, consider using a holding tank heater. They are similar to electric blankets and attach to the underside of the holding tanks with adhesive. 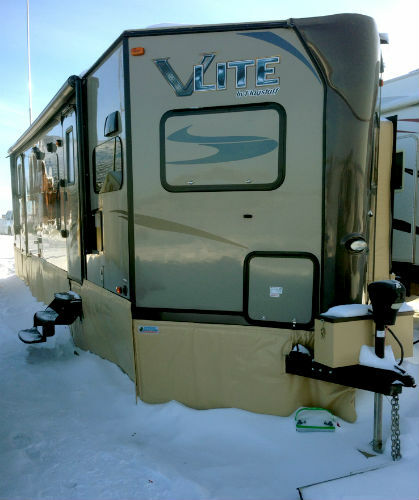 If you’re just an occasional winter camper, pour non-toxic RV antifreeze in your tanks through the P-traps or toilet. This will keep the contents slushy. Some RVers recommend using rock-salt, but it can corrode metal parts in the gray and black plumbing systems. 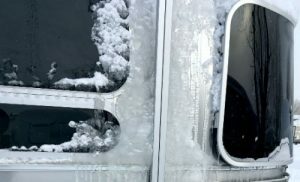 Regardless of how well you seal up your windows and vents to keep out the cold, you will still need an adequate heat source to keep your RV from freezing up. This is just one of the winter camping problems you’ll face. To overcome this, your built-in forced-air furnace should always be the primary source as the ducts are routed to keep the plumbing from freezing and keeping the occupants warm. Further, a secondary option is oil-filled electric heaters. They emit a mild radiant heat, are essentially noise-free, and present little fire hazards. Catalytic safety heaters, which run on propane rather than electricity, offer radiant heat and operate safely below the combustion level of flammable materials. Also, finding out how to effectively maintain power when winter camping is also pertinent to enjoying cold winter camping. How to find and prevent leaks in your RV is important any time of the year. But during winter it’s essential to keep yourself and your plumbing system warm by keeping the warm air in. So, while leaks need to be detected (and fixed), you also need to increase insulation for winter camping. Windows, roof vents, and skylights are good places to start. The majority of RV windows are single-pane and many don’t seal well. One option is to install storm windows (if offered by the manufacturer). Another solution is to insert heat shrink film on the insides of the windows. This is a clear film that you cut to size, stretch over your windows, and then heat shrink with a hairdryer. It’s available at most home improvement stores. Roof vents and skylights are the next places to insulate. Most RV accessory stores sell RV vent cushions, which fit into standard roof vents. They can simply push up in place. For larger openings like skylights, vent cushions can be custom made to fit precise sizes. Winter camping problems also extend to keeping a supply of fresh water. If you hook up to the campgrounds water spigot, you may freeze your hose. To offset this, utilize an electrically-heated RV hose, which is basically a hose with built-in heat tape. Another option is to leave a faucet dripping as moving water doesn’t easily freeze. If you do this, have your gray tank open or a significant gray tank capacity. Or, fill your freshwater tank and utilize your water pump. When your fresh water tank runs dry, refill it with the campground spigot. Also, drain or store the water hose somewhere warm between tank fillings. Who would think keeping food cold would be a problem when winter camping? Two problems can possibly crop up. The first is the mixture of chemicals and fluids in the refrigerator’s cooling unit can start turning into a gel below 20° F. This slows down the recirculating and cooling process. Another potential problem is the refrigerator thermostat sensor may sense cold air coming through the exterior refrigerator vents, rather than the cold air in the food box. This may cause the refrigerator to cycle-off. So, to avoid these winter camping problems, block the first two or three top vent slots of the exterior refrigerator access door. This will keep cold air from the back of the refrigerator. Don’t forget to remove the obstructions after your campout. For your refrigerator’s thermostat sensor, use a nonflammable material in the event it might come loose and contact the refrigerator burner or electric heating element. Once you realize these issues and start enjoying yourself, you’ll soon find out why RVing in winter can offer great experiences. I find it astounding that anyone would mention the use of an unvented propane-fueled heater inside an RV and not even mention either the critical need for ventilation, or the fact that these heaters are not safe for use while unattended or sleeping. Calling them “safety heaters”, just because their hottest point is not as hot as an open flame, is very misleading. Thank you, Brian. I got all excited thinking there was something I didn’t know about the catalytic heaters so I’d need to get one for cold-weather heating. You may have saved my life and/or others. We use one all the time, sometimes even two. Catalytics are great and if you’re worried about ventilation just open a window a crack. The main and only thing about them you have to be aware of is proximity to flammable materials and making sure it will not possibly tip over. !100% efficient heat from overpriced camper propane. There are catalytic’s that have auto shut offs in the event of low oxygen. Owners manuals for these types of heaters are full of warnings for adequate ventilation. The article is just presenting things to consider. Great article and great ideas. One thing that was not mentioned is the need for ventilation. Just people breathing makes a lot of condensation, and to prevent everything from becoming saturated you have to maintain air flow from the outside. The other thing that needs to be maintained is your propane and carbon monoxide detectors. Thank you, Brian. I was all ready to go out and purchase a catalytic heater for winter camping. You may have saved some lives. A cheap way to insulate window is bubble wrap on the inside. There is also greenhouse grade bubble wrap that is UV resistant and has better insulating properties. we live in nth fla at a campground and we use a radiator oil filled heater when it chilly but when it gets down in the teens or 20s we use our furnace so an oil filled heater is your best bet to save gas if you have electricity. All these are useful yet inadequate tips. The starting point for winter operations is buying a 4 season trailer. It will be entirely self-enclosed and have structure, windows, and floor insulated for the job. Anything less dooms the owner to a nightmare of problems and suffering. Since manufacturers routinely lie about this, any claimed 4 season trailer should be tested by at least a weekend of living in it in temperatures to ZERO F.
I use a house size dehumidifier when I run the heater in the RV while camping in the winter. It keeps the moister off the windows. Everything below the windows stays dry because there is no condensation dripping off the windows onto the furniture, walls, or floor. We don’t get the condensation problem while driving. Only while parked and at night. I’m guessing the cab heat etc., keeps a check on moisture while driving. They now make much smaller dehumidifiers for RV’s and small rooms. Around $ 75.00. I was not sure if the very small water holding tank would be big enough. It might need to be dumped way to often. I never tried the small one. it might be OK. We have been using this larger size dehumidifier for over 15 years now. It is still working really well and I like the very large water tank size. I dump it a couple times a day and it never gets full enough to shut off. It has a more dry to less dry turn nob to set for the right dampness you want. I keep it set somewhere in the middle. Seems ok for us. Once the main heater brings the living area up to temp a small space heater seems to maintain the 70 to 80 degree temp. We use a pillar type heater with settings to the temp I want the RV to be at. It has a remote so I don’t have to get up in the night to raise or lower the temp setting if needed to. It is very quiet and does not take up much space on the floor, table, or counter top. It turns on and off as it needs to for the temp I set it to. In a longer RV you might need two space heaters. Try one and see if it is enough. Make sure to keep away from blowing on walls, curtains, etc. Be sure it has a tip over censer to turn it off it gets bumped or vibrates off the table etc. Take your trailer or motorhome for a test campout before you go out on a winter trip. I had a outlet put inside my garage for our motorhome. ( 30 Amp ). If yours is 50 amp, have that one installed. Inside your garage keeps it out of the weather and animals or people can’t mess with it. When it is 40 degrees out side, spend a night or two in the camper in your driveway. Then again at 30 drees and again at 20 degrees and so on. Have two small space heaters ready. Know at what outside temp you need to add one space heater and when you need to add the second space heater to keep the rv at a comfortable temp to sleep. Use an electric blanket and one less space heater. See what works best for you. If you find air leaks, or other problems or it gets to cold and you can’t stay out there, turn everything off and just go into the house. Maybe leave the dehumidifier on just to keep the condensation at check till the camper cools off inside the next day. Fix all those problems and try it again the next week or so. After a few trial runs winter camping in your driveway and you know how it handles camping out in the winter and what to expect then you can plan your winter vacation or weekend away and you will be prepared for whatever winter will send your way. We live in Northeast Ohio. It does not snow everyday here. We plan our two or three day campouts on the days it is not going to snow. It does not matter how much snow is on the ground as long as the roads are clear. Sometimes it snows in the night but the roads are clear by mid day. Have it in your plans to stay put till noon after roads are cleared before you leave the campground for the next days drive. We try not to drive in the snow or ice if we can help it. PS – – – > Most campers have storage under the bed with doors to the outside. Use 2″ foam insulation glued to the bottom of the bed boards will help keep the bed warmer in the winter. In the past campers I have used plastic between the bed boards under the mattress for a little more air block for warmth for winter camping. It can’t hurt trying this stuff also. Enjoy your camper in the winter and keep warm. The “other” issue with any form of propane heat is condensation. Lots of condensation. My perception is that propane heat and water heater are far less of a problem than propane cooking because they are externally vented. Open flame cooking dumps huge amounts of combustion products into the accommodation. The solution is electric cooking. Campers are not equipped with electric stoves because of the electrical demand placed on the electric source. Most cooking is fairly short term and an easy solution is to crack a ceiling vent, there is usually one located above the range. We use electric for coffee and we carry an air fryer, otherwise the use the range. Our unit contains a CO 2 detector and we have never had it go off due to using the range. Basically all activities associated with living produce moisture, co2 and waste. When winter camping the object is to keep the operating systems functional and the interior of the coach comfortable, I have been primarily a winter camper for the last 40 years, it was the only way to share our passion for snow sports with 4 children and expose them to the big mountain experience. I can tell you that the early type A and C units didn’t exhibit design considerations for cold weather, it took me a few years of trial and error before I really dialed in the techniques for keeping everything functional and all the family comfortable. I have extensive knowledge of how to modify a coach to be able to sit slope side for 4–5 days in complete comfort and safety. Managing the inherent dangers of heating units and fresh air exchange is not something to err on. Thankfully over the last 10-15 years some of the better coach builders have incorporated design elements that have made their units outstanding for winter camping, in fact so much so that it’s now a pleasure to take our HR Navigator anywhere where it’s cold and comfortably watch as the temps dip down to O degree. One of the best developments has been the increase in heating systems that operate as a central unit distributing the heat to multiple zones in the form of a glycol based fluid throughout radiators in the coach. The heating unit often times is connected to the water supply in the form of a domestic heat and circulated through the engine block as well to preheat both the engine and the heating system. Along with improved insulation in the walls, floor and ceiling and quality insulated window units and properly operated vent fans the newer coaches are vastly better at cold weather camping. As always nothing is more important than using your common sense when involved with cold weather, always plan your routes and alternate options, keep in mind that every aspect of winter camping is more challenging than warm weather camping, make a mistake in the cold weather and the consequences are much more severe. I can’t over emphasize how important route planning and destination set up is. The other major factor is maintaining your coach properly for winter weather challenges, What maintenance I am referring to is focused on how well your rig is set up for traveling in winter weather conditions, the obvious being traction/steering control and all of the mechanical systems. Over time I have found that having good all season traction tires allows for travel under most typical winter driving conditions, having 25,000 to 45,000 lbs of ballast tends to get the most out of good traction tires. But to be truly prepared and to know how to install a set of rear wheel traction devices, such as tire chains or one of the many high tech traction enhancers is absolutely mandatory. All I can say is that the few times I was in danger of becoming mired in deeper snow and the subsequent nightmare that generally follows being stuck was that this simple traction adder got me back in control and safely to my destination. The basic idea is to have your coach as well prepared to handle winter driving conditions as possible. If the worst scenario that occurs is being stuck in some back country camp site until you can dig out at least you are set up to literally weather the storm in comfort. Some of the most memorable winter camping situations were when we were grounded by severe winter conditions and all comfortably situated in the RV playing games and drinking hot coco while a blizzard roared away outside. Our old motor home never had heat pads on any of the holding tanks. Colorado and yellow stone in May and they never froze. I guess the inside temp of the rv kept them from freezing up. Our new motor home ( purchased a month ago ) I had heat pads installed on all three tanks. Not a big expense but nice to have to have and use anyway. In this RV the water holding tank is under our bed. I’m guessing it won’t freeze because its inside the camper. The other two tanks are outside hanging under the rv. I’m betting they will freeze if not warm from heat pad. My worry is they are just stuck on the bottom of the tanks and will they stay there or someday come up stuck and fall onto the road. Our pads say they turn on at around 40 degrees or so and turn off around 50 degrees or so. Not sure if that is the right temp setting but somewhere around there. If they are not needed, they turn off and if it gets cold say at night they turn on automatically if you forget about them. They do come with a on / off switch for each pad to use in the summer when not needed or when you are not camping. I think it is worth the money but you decide if it is worth for you. A great idea. I’ll use it as a fallback. I hope to avoid the drawbacks of winterization. My goal is to always keep the interior above freezing. This should be easy in municipal areas by merely running the resistive heater in the AC unit which is on a thermostat. Underway I may try to use tow vehicle power or propane.